The ultra stiff suspension setup for the Power Wagons limits the everyday use of those trucks. If any part of the journey is on paved surfaces, it's best to stick with one of the other models. The 2017 Ram 2500 is a heavy duty masterpiece for work-minded buyers focused on capability. The heavy-duty truck arms race is alive and well, partly thanks to the Ram 2500. The truckmaker has claimed a few superlatives with its massive rig, including most available torque and best-in-class towing in different trims and specifications. Seemingly, every year a manufacturer manages to one-up the others (just barely, sometimes), but it's a safe bet to say that the Ram is right there in the mix with all the other heavy haulers. The Ram 2500 faithfully executes a blue-collar look among the group of big pickups that are getting increasingly tony. In certain high-dollar trims, the Ram 2500 can be festooned with enough chrome to nearly redirect all of the sun's energy, but most pickups will be straightforward like a shirt with your name on it—it's a work truck, after all. The Ram 2500 is aligned with the light-duty Ram 1500's overall look: it hasn't changed in quite a while and may lose out against more modern looks from Ford's Platinum trims or GMC's Denali spec. Starting with Tradesman work trucks, the 2017 lineup includes SLT, Big Horn, Power Wagon, Laramie, Laramie Power Wagon, Laramie Longhorn, and Limited models. Similar to Ram 1500 trucks, Limited trims get their own unique fascia that puts the Ram brand front and center—literally. 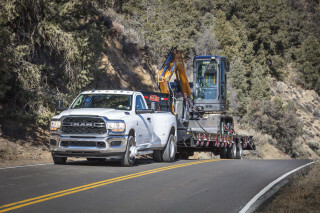 The common thread throughout the Ram heavy-duty lineup is that it's more at home on job sites than under bright lights; its look and feel are decidedly work-ready. Under the hood is a corporate 5.7-liter Hemi V-8 that produces 383 horsepower and 400 pound-feet of torque that is also available on the Ram 1500. 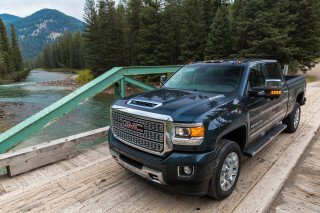 It's rated to tow up to 13,900 pounds in certain configurations. The 5.7-liter V-8 is standard on every trim except the off-road oriented Power Wagon, which opts for a bigger V-8 instead. That bigger V-8 available in every trim is a 6.4-liter version that makes 410 hp and 429 lb-ft, and is the payload champ—up to 7,390 pounds in certain trims. Its sonorous rumble is a little more satisfying than the 5.7-liter V-8, and we suspect that many buyers will be tempted by its increased capacity without switching over to the full-boat, massive diesel hauler. For 2017, Ram made the 6.4-liter V-8 a no-cost option in top trims of the 2500, which will please many buyers. 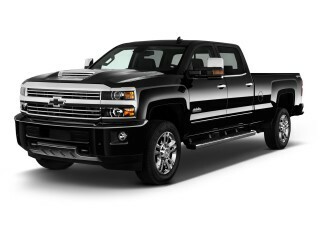 The optional oil burner is a 6.7-liter turbodiesel inline-6 that is rated up to 370 hp and 800 lb-ft (or 900 lb-ft in Ram 3500 models) and is the overall hauling champ—up to 18,000 pounds. 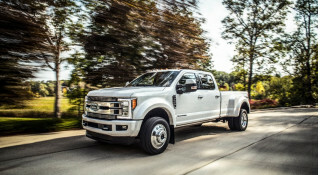 It's a massive motor that long distance runners will undoubtedly prefer, but compared to similar uprated diesel powertrains in the new Ford Super Duty and GM heavy duty trucks, it's just a little coarse. In all instances, the engines are paired to 6-speed automatics (a 6-speed manual is available in very limited circumstances on diesel-powered trucks, and it's the last of its kind) that work hard to keep the twist in line. Rear- or four-wheel drive is available on most models, except Outdoorsman and Power Wagon models, which are four-wheel-drive only. Base Ram 2500 models are about utility first—comfort takes a back seat, if there is one. Base trucks are fitted with vinyl interiors, an AM/FM radio, and little else. 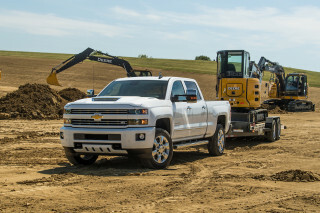 Regular-cab work trucks have hand-crank windows and manual door locks, something fleet buyers appreciate because they're two fewer things that can break. Like Ford and GM heavy-duty trucks, the Ram can be optioned to the hilt and can crest $70,000 in specific trims. Many models include Chrysler's corporate Uconnect touchscreen, up to 8.4 inches, and it's a system that we like. Its intuitive interface and straightforward commands are welcome against the universe of infotainment systems, but Ford's Sync3 and General Motors' IntelliLink/MyLink systems are just a little sharper than the Uconnect screens. 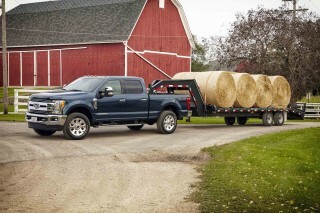 It's hard to top the Ford Super Duty's sheer number of available cameras (up to seven), but Ram throws in the standard complement, including a cargo camera for hitching a gooseneck trailer and rearview camera to assist conventional trailering hookups. In upper trims, the Ram 2500 can be shod with a small herd of cattle's worth of leather or long mega-cab back seats that rival limousines. Like most pickups, there are myriad configurations based around capability and use, including three different axle ratios for hauling or extra fuel mileage. Like the Ram 1500, the Ram 2500 uses a five-link coil spring rear suspension instead of a leaf-spring setup. A rear air suspension system is also available, offering improved ride and load-leveling capability, which also helps improve unladen ride comfort. Like other heavy-duty pickups, the Ram 2500 doesn't have a full set of safety ratings. 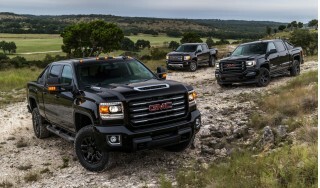 The feds have given the 2017 crew cab models a four-star overall safety rating with three stars for rollover protection in four-wheel-drive models. The IIHS hasn't yet tested heavy duty trucks. 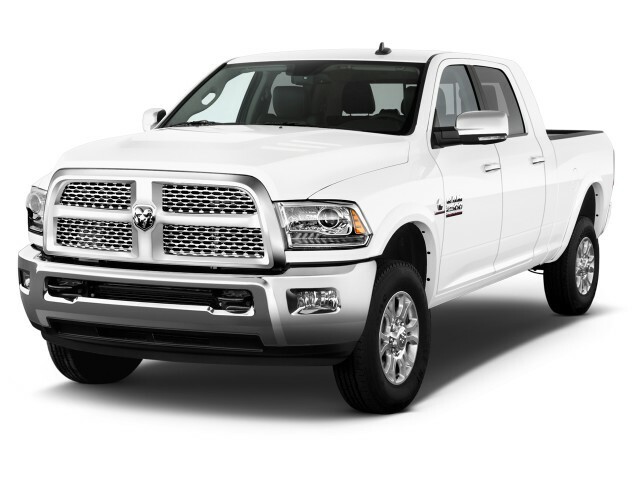 Every Ram 2500 comes with a standard complement of airbags and stability control systems. Ram hasn't yet added advanced safety technology to its pickups. Like all heavy-duty trucks, Ram doesn't report fuel economy figures to the EPA. Looking for a different year of the Ram 2500?